Since Joe Banner was forced out decided to leave the Eagles organziation for anyone who will take him a new, more difficult challenge, most of our focus has been on the Banner’s former underlings — Andy Reid and Howie Roseman. But what about his boss and friend, owner Jeff Lurie? Where does this firing departure leave him? I think one of the critical things to understand about Banner is what his role was over the years. You could call him Lurie’s right-hand man, but that would understate his impact. Lurie didn’t run the organization, Banner did. Lurie certainly had input into many things, and involved himself in major decisions, but for all intents and purposes he has been the chairman of the board, not the CEO. Banner was Lurie’s only real direct report and therfore was his default proxy in all aspects of the business — from the stadium to the football and everything in between. Everything flowed to Banner first, and the vast majority of concerns certainly never needed to make it to the owner’s box. But now Banner is gone. In his place are three different people. Dan Smolenski, the new president, doesn’t have his former boss’s scope. He will be in charge only of the business aspects. As to what happens on the field, it’s unclear exactly what the structure looks like between Roseman and Reid, but it doesn’t seem like either one purely reports to the other. What does that mean for Lurie? It means he’s gone from being strategically divorced from day-to-day operations by screening everything through Banner to being more involved in every part of the team. The dual wings of the organization can probably operate independently, but Lurie has placed himself in the unavoidable position of chief executive. Ultimately, one might write all this off as basic palace intrigue, but active ownership from Lurie is something we’ve never seen before. After the 2011 debacle, he was clearly disturbed by the way his Eagles were performing on the field and being perceived in the city at large. What steps might he take to remedy those problems, especially after he already made the tough choice to fire accept his childhood friend’s decision to leave? 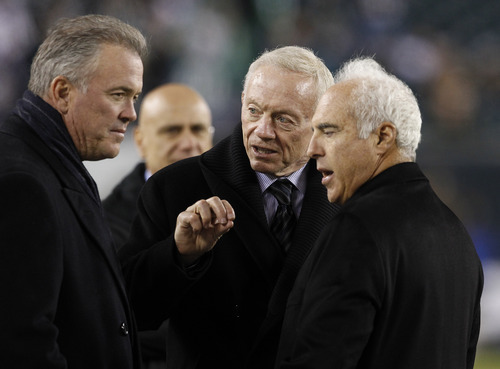 I doubt Lurie’s looking to model himself after peers like Jerry Jones and Dan Snyder, but there’s a wide expanse of potential influence he can exert on operations before reaching that extreme. Whether he does so will be important to keep an eye on going forward. Tagged with Philadelphia Eagles, NFL, Front Office, Jeffrey Lurie, Joe Banner, Howie Roseman, Andy Reid, Dan Smolenski, Jerry Jones, Dan Snyder, Owners. June 14, 2012 by Brian Solomon.